The best thing about making your own colloidal silver is that you can be generous with it. 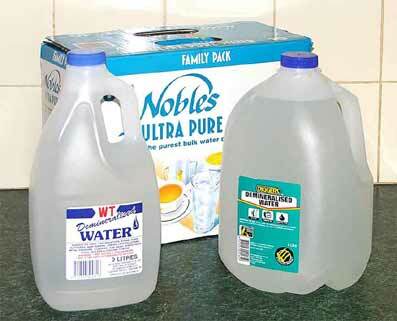 Distilled water is less than one dollar a litre. At that price you can try all those other suggested uses for colloidal silver. Keep a spray bottle handy in the kitchen and the garden. Splash it on to cuts and scratches. Spray it on rashes, itches and bites. Take the heat out of sunburn. Use it as a cooling and cleansing spray. Make CS gels. The Silver Well makes CS while you sleep, so you can make plenty for your family and friends. Colloidal Silver in health food shops is now nearly $50 a litre. A Silver Well Generator will pay for itself in just a few days! Click the ANIMATION button (far left) for a description of the electrolytic process that creates colloidal silver. Is home made colloidal silver as good as commercially made CS? Absolutely! In fact the colloidal silver you make at home with a Silver Well Generator is probably better than the CS you buy in the shops. Provided you are using a good quality silver maker, your home-made CS will almost certainly have a higher ionic PPM, and an equal or higher colloidal PPM. At home you are in control of the process so you know what's happening. Unfortunately some commercially made colloidal silver doesn't get such good care. Commercially bottled colloidal silver is often made using the same process but it is made fast, often at high voltages, and in bulk quantities. Its extremely hard to control the quality of large quantities so a lot of guesswork is involved. Also, because it's more difficult and more time consuming to produce good quality colloidal silver with a long shelf life, some commercial producers settle for a quick, easy, low ppm product. (5 ppm is a common 'standard'). Independent tests have shown that the actual PPM in some products varies hugely from what is stated on the label. Usually its much lower. In fact some commercial products were so low in silver content it was considered to be in 'homeopathic quantities'. Thats a nice way of saying that the silver content was virtually nil. But even worse, some other commercially produced high ppm colloidal silvers are actually mild silver protein (a kind of chemically produced silver concentrate) which has been known in some rare cases to produce mild argyria. The Silver Well Generator makes safe, clear, colloidal silver everytime - and it does it automatically! If CS is so cheap and easy to make why is it so expensive in the shops? Commercial bottlers don't have better technology than that used in the Silver Well Generator. (Often not even as good). They usually just have bigger volume equipment. The material cost of making colloidal silver is very low. Distilled water and silver wire is cheap. Even commercial size colloidal silver generators are relatively inexpensive. The big expense however is TIME. And time is money! Making good quality colloidal silver is a slow process even for a commercial generator. So with labour costs, rent, bottling, labelling, transport etc, plus the store's markup to cover its own staff and rent costs, its no wonder its $25+ a bottle. In a nutshell, the commercial colloidal silver is more expensive simply because its a retail product, not because its made by some superior manufacturing process. Do I have to use pure water? Yes! To make the safest and most beneficial colloidal silver for regular human consumption you MUST use the purest water you can find. No exceptions ever! This is usually steam distilled water or demineralised water from a high grade purification system. (You can buy it at all supermarkets). TAP WATER, SPRING WATER, MINERAL WATER ETC. IS NO GOOD. IT IS FAR TOO LADEN WITH IMPURITIES TO USE FOR MAKING COLLOIDAL SILVER. You must start with pure water so you finish with a colloidal silver product that contains nothing but pure water and pure silver. (And never add anything to the water while its brewing). We strongly recommend you purchase our TDS Meter to help you find the best distilled or demineralised water. The following comments should not be taken as my recommendation that you drink the CS made with any of these brands. I'm simply advising which brands make good CS. What you do with that CS is entirely your own decision. ANY WATER THAT GOES CLOUDY WHITE SOON AFTER THE POWER IS APPLIED IS NO GOOD! Water suitable for making colloidal silver should measure below about 2 ppm on a TDS meter or below about 4.5 uS on an EC meter. 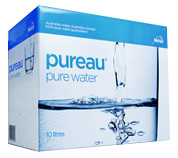 IN AUSTRALIA Nobles PUREAU water is probably the most widely available pure water, and is good value in 10 litre cardboard casks. It's purified using reverse osmosis. The quality in the past has always been good but lately seems to be variable. Pureau water is available in the drinking water department of most major supermarkets. About $8 for 10 litres. Note the packaging for Nobles Pureau has changed since the above photo was taken, its now a simpler white and blue box illustrated below. (www.noblebeverages.com). Note that in WA it may only be available in Coles stores. REFRESH distilled water is available in the drinking water dept of supermarkets (mostly Coles) in most states except S.A. (www.refreshwater.com.au). It is also in the 'auto products' dept in Big W in all states. It might be branded as Moore's in NSW and QLD. Customers tell me this makes good colloidal silver. GLENDALE distilled water is available at many K-marts. It's also available in bulk in NSW direct from the distiller. Demineralised or deionised water is more common and sometimes a bit cheaper than steam distilled water. I have usually found it to be very good for making Colloidal Silver. The quality of the water can vary but most of the brands from supermarkets including the generic brands (Black and Gold etc) seem to be good. I wouldn't use the brands from auto shops. Demineralised water is usually found in the 'ironing aids' aisle. It may be labelled 'Not For Drinking'. (Price is usually under $2 for 2 litres). UPDATE 14/2/18. WT brand demineralised water used to be highly recommended but Steric have sold their plant and are no longer making demineralised water. So WT brand is no longer availabe. BLACK AND GOLD distilled water and Coles SMART BUY demineralised water also seems to be quite good. DIGGERS brand demineralised water can be good but the quality seems to vary greatly so generally it is not recommended. SUPERIOR brand demineralised water bottled in Qld CANNOT be recommended. Western Australian customers tell me that DAVID GREY'S deionised water water is widely available and suitable for making colloidal silver although the quality seems to vary. A better option is to look for 'REFRESH' distilled drinking water in supermarkets. NEW ZEALAND customers tell me that 'PURE DEW' ultra pure water is ideal. It's available in 1 to 10 litre containers from Woolworths, The Warehouse, Pak 'n' Save, and New World. 'HDR8' brand distilled water available in Auckland has also been recommended. RAIN WATER. If you can catch it straight out of the sky in a perfectly clean container then its usually OK, but after its run across your roof, along your gutters, and into your tank then the quality is borderline and probably not suitable for making colloidal silver. WATER FROM HOME FILTER SYSTEMS. Tap attachments, simple under-sink cartridge filters, and counter-top pottery filters are totally unsuitable for making water for CS as they do not remove dissolved salts at all! The only home purification system (other than a distiller) that can produce water suitable for making CS is a high grade (usually expensive) well maintained reverse osmosis unit. But many home RO systems are not good enough, so even if you have an RO unit you will may still have to buy commercially purified water. D.I.Y. WATER DISTILLERS. Home distillers are becoming more affordable, and for some people they are a worthwhile alternative to buying water. I regularly use a 4 litre bench top electric distiller with a stainless steel tank and it produces quite good water. (About $120 on Ebay). However, if you are distilling water for CS there are couple of things to remember. Most importantly DO NOT use the charcoal or coconut 'post-filter' satchets. These filters put impurities back into the water that can spoil the quality of your CS batch. Also you should scrub the tank with a soap-free scourer and rinse it with clean water after every 2 or 3 batches. Also, if you can remember to do it, its a very good idea to turn the distiller off well before it fully empties so that the 'dregs' in the bottom of the distiller do not get boiled out into your receiving jug or get baked onto the bottom of the tank. What's wrong with using tap water? Why can't I use tap water? Won't it just make a mixture of colloidal silver and tap water? No, because as the silver ions are released from the electrodes they will immediately combine with salts, minerals, and other impurites in the tap water to form silver nitrates, chlorides, and other compounds. The end result is that you you won't get nicely isolated 'bio-available' colloidal silver ions and particles. This means that you are either wasting your time producing inneffective water, or possibly producing a cocktail that your body won't appreciate. To make the safest and most beneficial CS you must start with pure distilled or demineralised water. And never add anything like salt or baking soda to the water to speed up the brew. NOTE: Many travellers briefly use a colloidal silver generator to help sterilise local drinking water. This is probably a good idea for SHORT TERM usage, but after sterilising the water, there may not be enough free silver ions remaining in the water to be of significant further health benefit IN the body. CS made with impure water should not be consumed on a long term regular basis and a generator used for this purpose should be run for the shortest possible time. Storing colloidal silver - Glass or plastic bottles? There's been plenty of debate about whether to store colloidal silver in glass or plastic bottles, but I think most experienced makers now believe that good quality plastic is just as good as good quality glass. Personally I've never had a problem using HDPE plastic (the waxy type of plastic that demineralised water comes in), although some recent research suggests that PET plastic (Coke or mineral water bottles) MAY be marginally better. Demineralised water bottles don't need to be rinsed but Coke bottles should be well rinsed with clean warm tap water and allowed to drip dry. Larger volumes should be stored in a cupboard, out of the light, but its handy to keep a small coloured glass or plastic bottle on the kitchen counter for daily use. Should I store it in the refrigerator? Absolutely not. Always store colloidal silver at room temperature. The reason is pretty simple. Colloidal silver is simply water with silver dissolved in it. If you lower the temperature of the water then you reduce the ability of that water to keep the silver in solution. Cooling the water reduces it's 'saturation point', forcing the silver to precipitate out of solution and eventually settle to the bottom of the bottle. For the same reason you should NOT make colloidal silver with hot water. You are simply artificially and temporarily raising the saturation point of the water. When the water cools the silver will be forced out of solution to create large particles that will eventually settle to the bottom of the jar. Is colloidal silver light sensitive? Yes and no. A good quality batch of colloidal silver made with excellent water will often stay completely clear and colorless even in strong light. But batches are rarely perfect (even distilled water is never totally pure) so some degree of light sensitivity is common. Whether or not this makes much difference to the effectiveness of the CS anyway is debatable, but it's probably good practice to store CS out of direct light. What's this stuff about Ions and Particles? What most people refer to as colloidal silver is water containing silver ions and silver particles. Silver ions are silver atoms that have lost an electron. They are positively charged. (They are sometimes incorrectly called 'charged particles or even 'micro-particles' but in fact they are not particles at all). Silver ions, created via the the application of low voltage electricity, will dissolve in water. In good quality CS these ions are dispersed evenly throughout the water. As silver ions are released in the water they raise the electrical conductivity of the water, and consequently can be measured (approximately ) with a PPM or EC meter. The silver particles or collids on the other hand are exactly what the name implies - microsopic particles (colloids) that may be made up of relatively few, or many thousands of silver atoms. They may be pure silver, or silver oxides, but they are so small they stay permanently suspended within the water and do not settle to the bottom. Its important to note that these particles are not actually made 'by' the generator. They are created in the water as the ions combine. Current control and Stirring, as featured in the Silverwell system, helps to keep these particles small. These particles do not raise the conductivity of the water so they cannot be measured with a PPM or EC meter but you canb 'observe' then with a laser. Good quality CS generators are designed to make (1) a high concentration of ions that stay in solution and (2) the smallest possible particles because these are believed to be more 'bio-available'. (i.e. more easily absorbed by the body.) It is much better to have lots of very small particles than to have just a few relatively big ones. LVDC generators like the Silver Well make colloidal silver in which the total silver content is about 85% Ionic and 15% particles. A note on particle and ion sizes. A silver ion is a single silver atom that has lost an electron. All silver ions are the same size now matter how they are made. You can't get a silver component smaller than an ion. An ion is not a particle, but some producers will deliberately confuse the two in order to claim they produce extremely small particles or so-called 'microparticles'. Ions and particles are two completely different and beneficial forms of silver and as such need to be considered independently. For more information about ions and particles theres a lengthy discussion at the bottom of this page. What works best? Ions or particles? If you search the internet you will soon find very persuasive sites spporting both sides of the 'Ions Versus Particles' debate. But the truth is that no-one really knows if its the 'oligodynamic' properties* of the ions or particles that are the doing the most good in colloidal silver, although most current research seems to favour the ions. It's also possible that ions and particles both achieve the same thing, but in different areas of the body. There are also some theoretical chemical sequences that suggest that ions convert to particles in the blood stream, or alternatively, some particles release ions. What we can be sure of though, is that what most people have been using and praising for the last 20 years is colloidal silver that contains BOTH ions and particles - because that's the sort of colloidal silver that has been most readily available. Good quality, commercially bottled colloidal silver is about 85% ionic and 15% particles - the same as colloidal silver produced in a Silver Well. Statements by some bottlers that their 'new' CS is more effective because it is (supposedly) 100% ionic, or 100% particles, have no such history of everyday usage to support their claims. Quite simply, we dont need to take sides in the ions versus particles debate because the Silver Well gives you both. *The Oligodynamic property is the ability of small amounts of metals to exert a lethal effect on bacteria. (Greek: Oligos/small. Dynamis/power.) The effectiveness of some metals as germicidals is due to the high affinity of cellular proteins for metallic ions. Bacteria cells die due to the cumulative effects of ions within or in contact with the cell, even if the concentration of ions in the solution is miniscule. Exactly why these ions are lethal to bacteria is not fully known but it may be that they dissable the bacteria's ability to deal with oxygen. Can't I make my own basic generator? Yes its easy to make a basic generator and it can be an enjoyable project. But a basic generator makes a pretty basic form of colloidal silver. A simple home made system cannot consistently and easily produce stable, clear, colorless, colloidal silver. In fact, producing anything above 5 ppm with a home made generator can be frustrating. (The same goes for the cheap 'battery in a box' type commercial generators). If you want a clear, stable product, rich in isolated silver ions and small particles you need to build a much more sophisticated generator and have an excellent understanding of the principles of colloidal silver making. You should also have a stirring method of some kind. The high ppm colloidal silver in the wine glass on the 'What is CS' page was made with a Silver Well. It would be very difficult (probably impossible) to make anything like it with a basic home made system. Stirring produces cleaner, better colloidal silver with an abundance of small particles and a high ionic ppm, while still remaining clear and colorless. The bigger the batch, the more important your stirring system becomes. Very few generator manufacturers even mention 'stirring'. (We would sell more generators too if we dropped the stirrer and cut the price). But the fact is a stirring system of some kind is beneficial. Stirring moves the individual ions and particles quickly away from the electrodes so they can be isolated from each other by a surrounding barrier of water molecules. This is called 'hydration'. Without stirring, the ions and particles remain in high concentration zones where they are more likely to collide and combine - forming particles of ever increasing size. It is widely accepted that CS is much more effective when it contains billions of individually isolated ions and small particles rather than 'aggregated' clumps. Stirring also keeps silver suspended in the water, rather than it plating the negative electrode (cathode). And stirring keeps the ions well diffused throughout the water so you don't get a more conductive area beween the electrodes that can mislead the monitoring circuitry of a current controlled generator, possibly causing it to switch off too soon. What does PPM, TDS and PWT mean? PPM means 'parts per million'. Its a popular way of describing the amount of silver in the water. It really indicates the total combined weight of silver ions and particles in the water - it does not indicate the actual number of particles. (1 PPM is roughly equivalent to a total of one milligram of silver per litre. A milligram is one thousandth of a gram. So a litre of 10 PPM colloidal silver contains 10 milligrams of silver. That's just 10 thousandths of a gram). PPM can only truly be measured by a scientific laboratory using thousands of dollars worth of specialist equipment. No hand-held meter in the world can actually measure PPM, so hand-held PWT and TDS meters are a guide only. They really only measure the electrical conductivity (EC) of the water. (Silver ions make the water more electrically conductive). The EC or PWT (Pure Water Tester) gives that reading in microseimens, the unit of electrical conductivity. The TDS (Total Dissolved Solids) meter also just measures conductivity but then uses an inbuilt conversion factor to give a readout that (when doubled) is accepted as a reasonable approximation of the PPM. Colloidal Silver Generators with current controls (like the Silver Well) also use electrical conductivity to estimate the PPM. (See our Meters and Lasers page for more info). What PPM do I need? A PPM of around 10 - 20 has been shown countless times to be safe and effective. Most 'credible' commercial bottlers of Colloidal Silver claim that their product is in this range. (CS labels that claim ppm's significantly higher than this should be treated with suspicion). PPM in this range of 10 to 20 is easily and automatically produced with a Silver Well. The maximum clear PPM possible with an electric colloidal silver generator system is normally around 30 ppm. You can achieve this with a Silver Well if you follow a few special procedures such as using small jars and allowing the batch to stabilize between 're-charges'. IMPORTANT NOTE: Ulta high PPM colloidal silver (in the 100's or 1000's of ppm's) is not made electrically. It is made chemically or mechanically, and should not be confused with the modern, safe, Electrically Isolated (EIS) colloidal silver that is made with a Silver Well. Makers of these ultra high PPM products use very old research to support their claims of effectiveness. Should CS be yellow or clear? It was once considered that pale yellow was the ideal colour for colloidal silver. This was a reasonable statement, but it was also largely a matter of convenience for users of basic generators, as the color change from clear to pale yellow provided a visual indication that it was time to stop. (The color change indicated the electrolytic process had begun to accelerate and create larger, undesirable particles). Today however, current controlled, generators with a stirring system like the Silver Well are designed to only produce small particles and isolated ions, so the CS usually remains perfectly clear even when relatively high PPM colloidal silver is produced. So the short answer is: Yellow is OK, but clear is best. The Tyndall Effect (TE) is a visual indication of the presence of silver particles in the colloidal silver water. 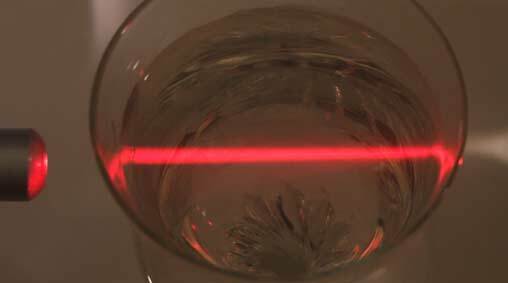 At left is the TE of the Colloidal Silver in the wine glass shown on the 'What is CS?' page. Under a bright, focused beam of light the normally invisible silver particles in the colloidal silver become visible as tiny points of light suspended in the water, even though in ordinary daylight the CS appears perfectly clear. The effect is visible in a liquid containing suspended solid particles, but not in a solution containing for example, dissolved salt or sugar. The Tyndall Effect is not apparent in distilled water. (It's usually not even very apparent in ordinary tap water because tap water mainly contains dissolved impurities not particles). It only appears after silver particles are created in the water. The larger the particles, the brighter the reflection, so with practice the Tyndall Effect can be used as a visual guide to the type of colloidal silver you are making: for example whether you have numerous very small particles, mixed fine and large (sparkling) particles, or mainly large particles. (In fact small particles are preferable, so a dense 'matt' beam is the ideal.) Note also that Conductivity, TDS (ppm), and PWT meters measure the silver ion conductivity only. They cannot detect these particles that are made visible by the laser. The Tyndall effect is the only simple way to determine the presence of silver particles. See another example on our 'TDS Meter and Laser' page. What about mixing it with MSM, DMSO, H202, and GATORADE? The vast majority of colloidal silver users just take it 'straight'. It's easy, safe and effective. But some users believe they can improve the bio-availability of the Colloidal Silver and help it pass the 'blood/brain barrier' (i.e. enter the central nervous system) by mixing it with other chemicals. The addition of MSM (methyl-sulfonyl-methane) or DMSO (dimethyl sulfoxide) possibly increases absorption and penetration in internal or external applications. 2 or 3 drops of 3% H2O2 (Hydrogen Peroxide) in a glass full of colloidal silver may break Colloidal Silver particles into even smaller particles, or turn ions into particles. One other popular additive is Gatorade. Colloidal Silver mixed with Gatorade (or similar electrolyte sports drinks) may speed up and improve absorption into the blood stream and tissues. The recommended CS/Gatorade ratio is 1 part CS to 2 parts Gatorade. There are reports of excellent results with this combination. One theory behind this is that the Gatorade and CS forms a compound of silver chloride that is more soluble in the stomach - and the more soluble it is the better chance it has of being absorbed. To some extent all these variations are still experimental. Whilst the drinking of 'Pure' Electrolytic Colloidal Silver now has a long history of safe usage, the long term effect of drinking large amounts of colloidal silver mixed with additives is not really known. Mild argyria is perhaps the worse that could eventuate (pure speculation on my part) but why risk even that without good reason? Furthermore, careless or incorrect use of some of these chemicals could be dangerous, or simply render the colloidal silver ineffective. (Strong H202 can burn skin. Even adding colloidal silver to ordinary drinking water could neutralise the colloidal silver). So before you go adding anything to your colloidal silver you should have a good reason for doing so, and thoroughly research the subject. Perhaps, even if additives do offer advantages, they should be saved for times of special need and not mixed with CS on an on-going basis. For more about H202, Gatorade etc see link 15 on our Links Page. What does LVDC and HVAC mean? These are terms you will come across on many colloidal silver sites. LVDC means Low Voltage Direct Current. HVAC means High Voltage Alternating Current. These terms refer to the type of electricity applied to the silver electrodes. The Silver Well is a LVDC generator. This is the method developed over the last 30 years to produce the electrolytic style of colloidal silver that most people are now familiar with. Medium and high voltage DC commercial systems also use exactly the same electrolysis method. High Voltage AC systems use high voltages in an 'arcing' process. Because they can produce bigger quantities faster, Medium and High Voltage DC and AC systems are popular with commercial CS bottlers. (Althought HVAC systems are now rare). Naturally enough, commercial producers looking for an advertising angle claim their High Voltage CS is the best but there is no evidence to prove that commercially made HV colloidal silver is any more effective than home made low voltage colloidal silver. In fact the reverse may be true as HV systems may not produce sufficient quantities of beneficial silver ions. HVAC colloidal silver producers also often claim that LVDC colloidal silver 'falls' rapidly out of suspension. This is misleading. Good quality home-made low voltage CS has as long a shelf life as any other good quality colloidal silver of an equivalent PPM. Commercial producers of both high and low voltage colloidal silver often achieve a long shelf simply by producing CS that is so low in silver (below about 5ppm) that there is almost nothing to drop out. Colloidal Copper and Colloidal Gold... a warning. The benefits and risks of colloidal silver have been well established over nearly a century of use, but that is not the case with gold and copper. Colloidal gold and copper purchased commercially in bottles is very expensive and the strengths are usually pretty low, so the chance you are going to ingest too much of that stuff is probably small. But if you can make and drink large amounts of much stronger stuff for just a few cents per litre then the chance of overdosing becomes much greater. This is something you really need to consider before heading in that direction. If you start making and drinking too much colloidal gold or copper you are in unknown territory. You are a guinea pig. How much is too much, and what are the dangers?... no-one really seems to know. I'd suggest you do plenty of research before going down that track. GOLD. A low voltage colloidal silver generator like the Silverwell cannot make colloidal gold. You need much higher voltages or various additives in the water. You can find plenty of videos about colloidal gold manufacture on Youtube, but personally its a bit too experimental for my liking. COPPER. A low voltage generator like the Silverwell will make colloidal copper but I do not recommend it for human consumption. and we do not sell copper electrodes. Copper toxicity can cause serious health problems. (Its easy to Google this). Copper deficiency is extremely rare so the likelihood that you need a copper top-up is remote. Personally I wouldn't touch it. FOR YOUR INFORMATION. HERE'S MORE ABOUT THE DIFFERENCE BETWEEN IONIC PPM, PARTICLE PPM, AND TOTAL PPM... but you don't have to read or understand any of it if you just want to buy a Silver Well and make colloidal silver automatically. When you use a TDS/PPM or EC meter in water you are actually just measuring the electrical conductivity of the water. (The meter then 'guesstimates' the ppm). So when you use one of these meters to measure colloidal silver you are only measuring the electrically conductive IONIC PPM. (Thats the dissolved silver). Only these silver ions increase the electrical conductivity of the water. Meters can't measure the silver that's contained in the PARTICLES because the particles are not conductive, but it's worth remembering that the particles (or colloids) hold significant additional PPM's within the batch. Although color is no accurate indicator of PPM strength, it does at least indicate that there are plenty of particles in the batch. If you are making CS for topical use such as in gels or sprays, where very high PPM is desired, and the color of the batch is not a concern, then its important to know that your TOTAL PPM may be vastly higher than just what is measured by the TDS or EC meter. The grey curved line indicates the Total PPM. The background color indicates the color of the water of this imaginary batch at that total PPM. The example brewing time here is 15 hours, but depending on variables such as water volume it could just as easily have been 1 hour. The graph above plots the progress of an IMAGINARY batch of colloidal silver over a period of 15 hours. IT'S NOT A SILVER WELL BATCH, or any other kind of typical batch. It's just an imaginary batch I've constructed 'on paper' to illustrate a few points - including the point that there may be much more silver in the batch than what you might simply measure with a TDS meter. It should not be viewed as advice that every batch will go yellow from about 10 PPM or go dark grey at 80 PPM. (A real batch can go yellow from as low as 3ppm). A. The 5 hour mark. This would have been the perfect place to stop this imaginary brew. The TOTAL PPM (the grey line) is 15. The IONIC PPM (red) is about 13 (a proven safe dose and very effective if you drink enough) and the PARTICLE PPM (black dots) is about 2. But the water is still nice and clear indicating that those particles are tiny. This would be very nice CS. Although this is an imaginary batch, most research seems to suggest that good quality CLEAR CS is usually about 85 - 95% ionic and 5 - 15% particles, so a TDS or EC meter that only measures the IONIC PPM can probably, by reasoning, provide a clue to the TOTAL PPM as long as the CS is CLEAR. B. The saturation point. The saturation point is the limit at which water will continue to hold another substance (in this case silver ions) in solution, so in theory this is the highest ionic ppm that can be achieved. Above this point the ions will precipitate out of solution, form particles, aggregate into larger particles, and eventually, if the particles get big enough, fall out of suspension over a period of hours or days. In this imaginary brew the saturation point is about 24 ppm but it varies depending on factors such water quality and temperature. It's important to note however that tiny particles can begin to form and aggregate well below this saturation point - as indicated by the Tyndall Effect in a laser beam, or the yellow colour of the water. The presence of particles may in some instances prevent the batch from ever reaching its saturation point because particles continually draw ions out of solution. Note about particles. Particles (the dotted black line) begin to form almost as soon as the power is switched on. The aim is to minimise the particle size. This is best done by using a combination of current control and stirring to create ions and particles slowly, and disperse them to low concentration zones where the conditions are less advantageous for particle aggregation. C. The 7 hour mark. The operator probably should have stopped this batch as soon as it developed a little bit of color. The TOTAL PPM (the grey line) is now about 30 but the water is starting to turn grey. The batch is near saturation point for IONIC silver so the particles are rapidly becoming more numerous and larger. It's borderline quality for drinking but its fine for topical use. Note about colour. The colour change of the water is usually not as simple as a straight progression from clear to yellow to grey. Very often the water will go straight from clear to a very pale grey without any apparent yellow stage. But often that pale grey CS will turn yellow if you leave it overnight. 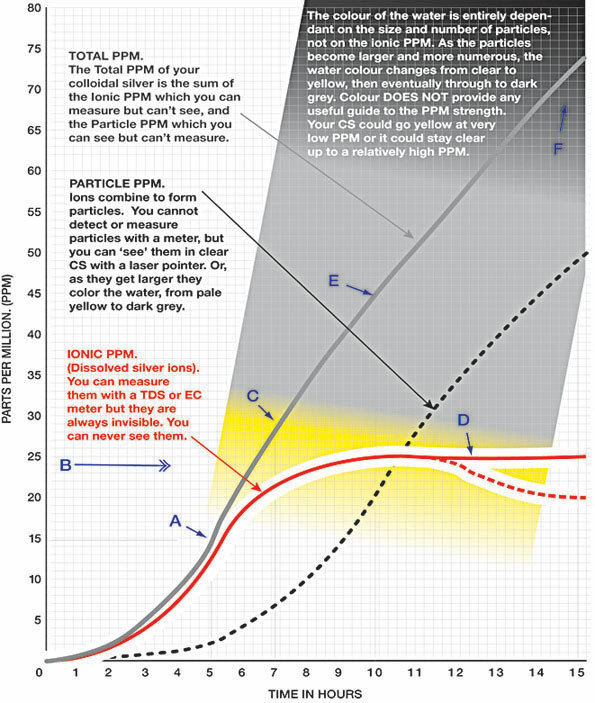 D. This 'leveling out ' of the IONIC PPM (as illustrated by the red line) often leads at-home CS makers who use a TDS meter to think that the PPM of their colloidal silver is no longer increasing. In fact the TOTAL PPM is increasing rapidly. The process of electrolysis will continue to dissolve silver ions into the water as long as the power is on, but in our imaginary brew the saturation point of the CS has been reached so those silver ions can't stay in solution. They are coming out of solution and forming particles as fast as they are dissolving off the electrode. As particles become larger they develop a greater power to attract and draw ions out of solution. In fact they can sometimes attract the ions faster than the ions can be produced, resulting in a drop in IONIC PPM as illustrated by the red dashed line. This means that your TDS meter can show a drop in IONIC PPM even while you continue to brew. E. At the 10 hour mark, the total PPM of this imaginary batch (the grey line) is about 45, but a TDS meter would only show 24 ppm because it can only measure the PPM of the IONIC silver (the red line). The effect of stirring and current control in a good quality generator is to delay the formation of particles for as long as possible, and to minimise their size when they do start to form. F. After 15 hours. The water is now very dark. This is CS for the garden or for making GEL thats the color of axle grease. (I have, and I quite like it). But I definately wouldn't drink it. Total PPM in this imaginary batch is 75 PPM but a real batch this color might be hundreds of PPM. FOOTNOTE: It's impossible to make a chart of colloidal silver production thats both simple AND accurate. This chart definitely leans towards the former so treat it as a 'learning aid' rather than a guide for CS production. Every batch will follow its own unique path anyway, unless you have repeatable outcomes provided by a current controlled generator with auto shut-off like a Silver Well.